Today's entry in the This day in Islamic Terrorism Series. metal remains of the rental truck. The FBI traced the number to the rental agency and arrested Mohammed Salameh when he returned to collect a four hundred dollar deposit on the truck. The four men directly involved were all arrested and sentenced to 240 years of prison. "It should have been a wake-up call for America," said New York Police Commissioner Raymond Kelly, who held the same position at the time. "We simply didn't see it as an international conspiracy to destroy our society." Largely because our government refused to acknowledge the importance of jihad in Islam. The History Channel has this story listed in the crime section, and doesn't mention Islam or terrorism at all. Never mind recognizing the enemy, we couldn't even identify the motives, or connect the dots between this and previous attacks. The significance of the attack "was not fully understood by the critical mass of the United States until Sept. 11, 2001," said James Kallstrom, a former FBI assistant director who is now Gov. George Pataki's senior adviser on terrorism. I would say we still haven't. The 1995 capture of Yousef in Pakistan signaled the emergence of a wealthy benefactor: Osama bin Laden. Yousef was found in a guest house for Afghan war veterans financed by bin Laden. He had sought refuge there after failing in a plot in the Philippines to kill 4,000 people by blowing up 12 U.S.-bound airliners. A computer used by Yousef and interrogations of another terrorist who lived with him in Manila revealed that several Middle Eastern pilots were training at American flight schools. At least one had proposed hijacking a plane to crash into federal buildings. Yet we still let Osama Bin Laden go free back in 1998 for fear some UAE Prince's might get killed in the process. Five years later we're trying to sell 21 of our ports to a UAE government-owned company. It's interesting what both of these incidents have in common. "We don't want to send the wrong message"
What message are they sending us? The This Day in Islamic Terrorism series continues with February 21, 1970. A Swiss Air flight 330 from Zurich bound for Tel Aviv was bombed in mid-air nine minutes after takeoff by the PFLP General Command, a PFLP splinter group. Forty-seven innocent souls lost their lives to Islam, 15 of whom were Israelis. The bomb, placed in the cargo hold, was triggered by a change in atmospheric pressure. While the crew attempted to turn the plane back to the airport, smoke in the cockpit and the loss of electrical power thwarted their efforts. While the PFLP-GC initially claimed responsibility, when it became obvious the civil people the world over were repulsed by their crime, they disclaimed it. It was as if their words meant something. The Popular Front for the Liberation of Palestine-General Command (PFLP-GC) was established in April 1968 by Ahmed Jabril. At the time, he was a member of the PFLP, the PLO, and a captain in the Syrian Army. He was a good Muslim jihadist, who wanted to focus more on terrorism and less on politics. As such, the PFLP-GC exists to perpetuate armed insurrection against Israel. Their logo describes their purpose and their methods. Israel is painted entirely in Islamic green with crossed assault rifles superimposed over the nation. On the same day, a bomb exploded aboard a Vienna-bound Caravelle after takeoff from Frankfurt. The Caravelle landed safely. Also read, Islam on this Day. The latest installment of the This Day in Islamic Terrorism series. Mumbai was nothing new to India. Jihad has been ravaging that region for over 1000 years. The first attempted invasion of India by Muslims occurred in 636 CE -- under Caliph Umar, within four years of Muhammad's death. "The massacres perpetrated by Muslims in India are unparalleled in history, bigger than the holocaust of the Jews by the Nazis; or the massacre of the Armenians by the Turks; more extensive even than the slaughter of the South American native populations by the invading Spanish and Portuguese." This is one such occurrence 11 years ago today. On Saturday, February 14 1998, in the city of Coimbatore, Tamil Nadu, India. 46 persons - 35 men, 10 women and one child - were killed and over 200 injured in 13 bomb attacks in 11 places , all of them within a 12km radius, 4 bombs were planted at R S Puram area, two near Bus Stand, 1 near Coimbatore Medical College Hospital and at Ukkadam area. These car bombs was the work of Muslim fundamentalist group "Al Umma" which had a strong presence in Coimbatore. The bombings were apparently in retaliation to the earlier riots in the city the previous year, when Hindu gangs and Fundamentalist Muslim groups clashed with each other following the murder of a traffic policeman named "Selvaraj" , by a member of the radical Islamist group Al Umma (The Ummah). The first of the serial bombs exploded at 3.50 p.m. on Shanmugham Road in R.S. Puram, 100 metres from the venue of an election meeting that was to be addressed by Bharatiya Janata Party president L.K. Advani. There were allegations that suicide bombers were ready to target L.K.Advani on that day. (Pictured Left) On West Sambandam Road in Coimbatore, bodies of two victims of one of the 13 bomb explosions that rocked the city on February 14. (Right) BJP president L.K. Advani, whose election meeting in the city was cancelled following the explosions, at the Coimbatore Medical College Hospital. In the foreground, a woman mourns the loss of her son. S.A. Basha and 34 other persons have been convicted for the conspiracy of bomb blasts in Coimbatore, India for a life term. There were 4 bomb blasts in Coimbatore on 14th February 1998. There were 12 blasts in which 54 innocent people died. One of the suicide bombers was to target L.K. Advani, however he did not activate the bomb which was aimed at L.K. Advani as Advani’s flight was delayed and had not reached the venue of the meeting on the fateful day. Basha was head of Al Umma, an extremist organization in Tamil Nadu formed in 1993, which had been accused of masterminding the bomb blasts. Till the eighties, there were hardly any extremist organizations in Tamil Nadu. However, after the demolition of Babri Masjid in 1992, Islamic extremism spread to Tamil Nadu and Al Umma was one such organization. Read more about Al Umma's terrorist tactics here. The latest installment of the This Day in Islamic Terrorism series comes to us via POD. On February 3-4 1986, a series of bombings in Paris left twelve injured. But it could have been a lot worse. A powerful bomb rocked an elegant shopping gallery on the Champs-Elysees during the morning rush. Eight shoppers were wounded. The following day, an Islamic terrorist group calling itself the "Committee of Solidarity with the Arab and Middle East Political Prisoners (CSAMEPP)" claimed responsibility for the bombing in a letter to Agence France-Presse. Hours later, a second bomb was found in a public lavatory on the third floor of the Eiffel Tower. It was defused 90 minutes before it had been timed to go off. There were 100 tourists on the tower at the time and many of them would have been killed. A few hours after the Eiffel Tower bomb was defused, a third bomb was detonated in a crowded bookstore in the popular Latin Quarter tourist area. Four more people were injured by this blast. The Committee of Solidarity with the Arab and Middle East Political Prisoners (CSPPA) claimed responsibility for it as well. CSAMEPP was initially thought to be a pseudonym for the Lebanese Armed Revolutionary Faction (LARF) because the perpetrators demanded the release of several LARF terrorists who were being held in French jails. Each had attacked pro-Shah Iranian, American, or Jewish targets. Among those whose release was sought was Anis Naccache. He was incarcerated for killing two people while attempting to assassinate the former Iranian Prime Minister, Shahpur Bakhtiar, in Paris in 1980. They sought Georges Ibrahim Abdallah, a Lebanese Shia Muslim who was charged with complicity in the assassination of an American military attaché (U.S. Lieutenant Colonel Charles Ray on January 18th, 1982) and an Israeli diplomat (Yacov Barsimantov on April 3rd, 1982). This being the case, insurgent groups in Lebanon were blamed in the French media. However, in the summer of 1987, evidence was brought forth to implicate the Iranian government itself, demonstrating that the Shia clerics ruling Iran were directly involved in the Paris bombings. Thirty-four members of the Shia fundamentalist group Hizballah (Hezbollah), who had been residing in France, were arrested. At the time, the French Interior Minister accused the Ayatollah Khomeini of having personally directed the bombing campaign in France. If true, the most fundamentalist Islamic regime on earth had once again sponsored the use of terrorism, directly implicating the religion of Islam. The CSPPA was a group of Paris-based Shiite Muslims who were all member of Allah's Party, known as Hezbollah. They reported directly to the Iranian Islamic theocracy. Their 1985 and 1986 bombings of public places in Paris killed 13 people and injured over 300 more. The bombings were perpetrated to influence French foreign policy towards the Iranian nuclear program. The Iranian government hoped to accelerate negotiations over a one billion dollar financial claim it had against the French. The Iranians had advanced French firms $1 billion to finish and fuel a nuclear reactor that had been part of the American "Atoms for Peace" program during the Ford administration. But the French had pocketed the money without fulfilling their contractual obligations. Further, the Iranians wanted to induce the French government to stop providing arms to its enemy Iraq, and also to gain the release of jihadists linked to Hezbollah and the Iranian government. In a culture where life is meaningless and power is everything, killing innocent people to influence armament policy seemed moral and just in the eyes of the Islamic religious regime. Initially, French authorities accused the Lebanese Armed Revolutionary Faction (LARF) of committing these crimes. But then in early 1987, investigators learned from an informer that the attacks had been carried out by a group of Shiite Muslims based in an Islamic school in a Paris suburb. The religious institution was run by Shia imam Fouad Ben Ali Saleh. Subsequent wiretaps led investigators to suspect Wahid Gordji, a translator at Iran's Paris Embassy, of coordinating the attacks. In June, French authorities subpoenaed Gordji. When French police went to his home to arrest him, he had fled to the Iranian Embassy in Paris. This led to a six-month standoff in which French police surrounded the complex. Although Gordji was not registered as a diplomat and therefore did not have immunity, the Iranian government argued that Gordji was protected as a member of their embassy staff. During the standoff, an Iranian official claimed Gordji was the Deputy Chief of the Embassy. In response, Iranian police surrounded the French Embassy in Tehran. The two countries severed diplomatic relations in July and Hizballah took several French citizens hostage. The standoff ended in November 1987 when Gordji was briefly interviewed by French authorities before being freed to fly off to Iran. The French hostages in Lebanon were released shortly thereafter and full diplomatic relations were restored in June 1988. Iran claimed that France expedited the repayment of the one billion dollar advance it had made. The imams also claimed that the French had agreed to crack down on pro-Shah activity in France. The Ayatollah said that the French paid a multi-million dollar ransom to the Lebanese kidnappers of French citizens. However, French Prime Minister Jacque Chirac, not wanting to look like he capitulated, denied that any deal was made and that these things were all unrelated. In 1992, seven years after the fact, Fouad Ben Ali Saleh, the religious and scholastic leader of the Islamic student network that carried out the bombings, was sentenced to life imprisonment for his role. Two accomplices were also jailed for life, and a third received a 20-year sentence. Several Lebanese citizens were tried in absentia because they had fled the country. Part of the This day in Islamic terrorism series. There has been a long time alliance between the far left and jihadists, But this is only example that I know of where the two physically work together in a terrorist operation. On 31 January 1974, four men armed with submachine guns and explosives attacked the Shell oil refinery complex on Pulau Bukom, a small island lying south of Singapore. The terrorists were two members of the Japanese Red Army (JRA) and two members of the Popular Front for the Liberation of Palestine (PFLP). Their goal was to disrupt the oil supply from Singapore to other countries, especially South Vietnam. On 1 February 1974, a PFLP spokesman made a statement in Beirut that the attack was a warning to all monopolistic oil companies on one hand and imperialism in general on the other - especially the perceived oppression of the Arab masses in the Middle East. At the beginning of their operation, the terrorists' boat ran aground on a coral reef. They managed to reach the shore of Bukom after convincing an unsuspecting boatman to tow them towards the island. As they headed towards a gate of an oil tank farm, they fired shots at two passing vehicles although no one was injured. A sentry at a security post managed to escape and raise the alarm. The terrorists were able to detonate 3 of the 12 explosives they were carrying, but they caused little damage. To escape, they then hijacked the ferryboat Laju at the Bukom jetty and held 5 crew members hostage. This led to a chase and Laju was quickly surrounded by marine police boats and navy gunboats at the Eastern Anchorage. This was followed by a few days of intense negotiation, during which two hostages managed to escape by jumping overboard in the middle of the night. The terrorists later agreed to release the other crew members in exchange for a party of "guarantors" for their safe passage to the Middle East. This 12-men party consisted of 4 commandos from the Singapore Armed Forces and 8 other government officials. The party was led by the Director of Security and Intelligence Division at the Ministry of Defence, S R Nathan, who later became the President of Singapore and Mr Tay Seow Huah, the first Director of Security and Intelligence Division. On the night of 7 February, the group was transferred from Laju to the Marine Police Headquarters and then to the airport. After they freed the remaining three hostages, the four terrorists left Singapore on 8 February at 1:25 am, accompanied by Nathan’s team on a flight to Kuwait. Feb 3 1986, Pro Iranian group Fouad Ali Saleh bombs the Claridge Passage in Paris, 7 injured. Feb 14 1998, India Coimbatore bombings, Bombings by suspected Islamic Jihadi groups on an election rally in the city of Coimbatore kill about 60 people. Feb 16 2002, Two teenagers were killed and about 30 people were wounded, six seriously, when a suicide bomber blew himself up at a pizzeria in the shopping mall in Karnei Shomron. A third person subsequently died of his injuries. The Popular Front for the Libera. Feb 18 2002: An Israeli Bedouin policeman was killed by a suicide bomber whom he had stopped for questioning on the Ma'ale Adumim-Jerusalem road. The terrorist succeeded in detonating the bomb in his car. The Fatah al-Aqsa Martyrs Brigades claimed responsibility. Feb 21 1970 Popular Front for the Liberation of Palistine bombs SwissAir 330, killing 47. Feb 23 1985 Hezbollah bombs a Marks and Spencer shop in Paris, 1 killed. Feb 24 1997 Ali Abu Kamal opens fire on tourists at an observation deck atop the Empire State Building in New York City, killing a Danish national and wounding visitors from the United States, Argentina, Switzerland and France before turning the gun on himself. A handwritten note carried by the gunman claims this was a punishment attack against the "enemies of Palestine". Feb 25 - March 4 1996, A series of four suicide bombings in Israel leave 60 dead and 284 wounded within ten days. 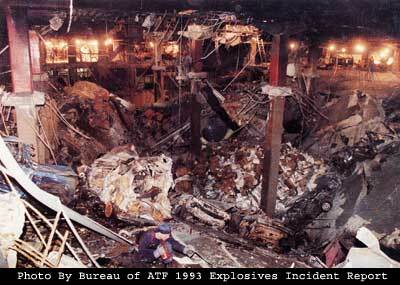 Feb 26 1993 World Trade Center bombed by AQ, 6 killed, over 1000 injured. Feb 27 2002: A Palestinian suicide bomber blew herself up at a roadblock on the Jerusalem-Modi'in highway, injuring three policemen. On January 23, 2002, on his way to what he thought was an interview with Sheikh Mubarak Ali Gilani at the Village restaurant in Karachi, Pearl was kidnapped by a militant group calling itself The National Movement for the Restoration of Pakistani Sovereignty. This group claimed Pearl was a CIA agent and — using the e-mail address — sent the United States a range of demands, including the freeing of all Pakistani terror detainees, and the release of a halted U.S. shipment of F-16 fighter jets to the Pakistani government. We give you one more day if America will not meet our demands we will kill Daniel. Then this cycle will continue and no American journalist could enter Pakistan. Photos of Pearl handcuffed with a gun at his head and holding up a newspaper were attached. There was no response to pleas from Pearl's editor, and from his wife Mariane. Nine days later, Pearl was murdered and beheaded. Pearl's body was found cut into ten pieces and buried in a shallow grave in the outskirts of Karachi on May 16. When the police found his remains, Abdul Sattar Edhi arrived promptly on the scene, personally collected all ten body parts, and took them to the morgue; then his body was returned to the United States and he was interred in the Mount Sinai Memorial Park Cemetery in Los Angeles, California. Khalid Shaikh Mohammed was one of the terrorists held at Guantanamo Bay. The Jan 11 edition of the This Day in Islamic Terror series. Sidi-Hamed massacre took place on the night of January 11, 1998 (the last day of Ramadan), in the town of Sidi-Hamed (or Sidi-Hammad), 30 km south of Algiers. An estimated 50 gunmen poured in, attacking children and adults alike; they bombed a cafe where films were being watched and a mosque in nearby Haouche Sahraoui, slaughtering those who fled, and stormed houses to slaughter those within. According to official figures, 103 were killed and 70 injured, including 2 pro-government fighters and 5 of the attackers. Other sources indicate a higher toll; AFP supposedly counted over 120 corpses, and some Algerian newspapers claimed 400. 30 girls were reportedly kidnapped. The massacre was generally blamed on the GIA. One newspaper claimed that survivors blamed it on the AIS. As part of the This Day in Islamic Terrorism series, we remember the Kizlyar-Pervomayskoye hostage crisis, Jan 9-18 1996. The Kizlyar-Pervomayskoye hostage crisis, known in Russia as the terrorist act in Kizylar was a guerrilla raid conducted by the Chechen separatists in January 1996 during the First Chechen War, which soon turned into a massive hostage crisis involving thousands of civilians. The crisis culminated in a days-long fierce battle for the Dagestani border village of Pervomayskoye, resulting in the village of 1,200 people being completely destroyed by the Russian bombardment, while the rebels escaped with some of their hostages including captured servicemen. More than 100 people died during the crisis, including at least 41 civilians. On January 9, 1996, "Lone Wolf" unit led by the Chechen separetist commander Salman Raduyev, allegedly acting on Dzhokhar Dudayev's order, launched a copycat raid in the style of the Budyonnovsk hospital hostage crisis against the helicopter military airfield and later a civilian hospital in the city of Kizlyar located in neighbouring republic of Dagestan. A field commander Khunkar-Pasha Israpilov later said that he took over command of the operation from Raduyev after the latter failed in his mission to destroy the federal airbase, ammunition factory and other military and police installations in and around the city. Only two or three helicopters were blown up at the airbase, but at least 33 people were killed in the assault and scores were injured. Rebel fighters led by Raduyev then entered the town itself, where they took at least 2,000 to 3,400 hostages and held them at a local hospital and a nearby high-rise building and a bridge. (According to the Russian officials, there were "no more than 1,200" hostages taken.) At least 13 people were killed in street fighting and 19 in the following siege (including 24 civilians. All but about 120 of captives were released the next day, after Russian authorities said they rebels must first release the hostages to get granted a safe passage back to Chechnya. About 160 hostages, some of them reportedly volunteers, were carried along by the guerrillas to act as human shields in order to deter Russian ambush along the route. The rebels then headed in the direction of Chechnya in the column of 11 buses and two trucks, but they were halted when a Russian attack helicopter suddenly opened fire on their convoy as it approached the border between the two republics. A group of 37 Novosibirsk OMON policemen, who escorted the convoy and were caught in a crossfire, surrendered to the Chechens. The rebels rushed for cover to the nearby village of Pervomayskoye , where they put the hostages into a local school and a mosque and put the captured policemen to build trenches. According to Itar-Tass, the Chechens seized an additional 100 hostages from among the population of the village. Some of the civilians were reportedly given weapons while some captive policemen joined the by the gunmen. Read more about the long and bloody history of Chechen 'rebels' habit of hostage taking. Also read, Russia: A Timeline Of Terrorism Since 1995. Part of the This Day in Islamic Terrorism series. Jan 3, 1978. Dinner was finished. Because they had eaten so well, the four children of Mr. and Mrs. Frans Bergs in the southern Dutch town of Maastricht were granted a favorite treat for dessert: big, golden Jaffa oranges from Israel. Unexpectedly, the children complained about the taste. "When we took a closer look," Mrs. Bergs said later, "we discovered small, silver-colored globules inside." The children were rushed to a hospital to have their stomachs pumped; police summoned to investigate erroneously assumed that Mr. Bergs had tried to poison his family. But Dutch health officials began a nationwide search, and by week's end they had discovered 25 oranges from Israel that had been injected with mercury. More sabotaged Israeli oranges were found in nine West German towns. The pea-sized pellets were not soluble mercury, which can severely damage the kidneys if ingested, but the metallic mercury of the kind used in thermometers —potentially dangerous to very young children but not to adults. Nonetheless, the tampered oranges were a shock to Europe, especially after it became known that they were fruits of political terrorism. In a letter to the West German government, an extremist group calling itself the Arab Revolutionary Army-Palestine Command claimed it had doctored the fruit to disrupt Israel's economy. At least temporarily, it may have done so. In West Germany, which annually imports 140 million tons of citrus products from Israel, sales were halted while the fruit was checked out. In The Netherlands, supermarket managers put their Jaffa oranges in cold storage until the poisoning scare blew over. For Israel, the rash of ruined oranges constituted both a new kind of Palestinian attack and a potential economic disaster. The $172 million annual orange export trade is one of the country's major sources of foreign exchange. Israeli growers insist that the injecting took place at shipping centers in Europe and not at the groves themselves; their hypothesis sounded more and more reasonable as first Spanish and then Moroccan oranges, which move through the same European distribution system, displayed the same mercury traces. The Jerusalem Post sarcastically attacked the Palestinians: "They now send their freedom fighters to stab—if not with the sword at least with the syringe—the harmless Jaffa orange." Leaders of the Palestine Liberation Organization were embarrassed by what appeared to be a propaganda boomerang against them. They disavowed the Arab Revolutionary Army and denied that Palestinians had had anything to do with the fruits of terrorism. The Islamic Terror Calender for January. Jan 1, 1978 (no date given) Arab Revolutionary Council poisons Israeli Oranges with mercury. Jan 3, 1999 Pakistan, Gunmen open fire on Shi'a Muslims worshipping in an Islamabad mosque, killing 16 people and injuring 25. Jan 9, 1996 Kizlyar airbase raid at least 33 people were killed in the assault and scores were injured. Jan 10-19,1996 Jan 10-19 Siege of Pervomayskoye at least 78 killed. Jan 11, 1998 Algeria Sidi-Hamed massacre Between 120 and 400 people are killed when the Armed Islamic Group bombs a mosque in Haouche Sahraoui and opens fire on civilians in a cinema in Sidi Ahmen. Jan 12, 2002 Singapore Embassies Plot foiled. Jan 23, 2002 Daniel Pearl Kidnapped, Beheaded. Jan 25, 1993 Mir Aimal Kasi fires upon cars near the CIA HQ. killing 2, injuring 3. Jan 30, 2002: An 81-year-old man was killed and over 150 people were wounded, four seriously, in a suicide bombing in the center of Jerusalem. The female terrorist, identified as a Fatah member, was armed with more than 10 kilos of explosives. Jan 31, 1974 PLFP in conjuction with the Japanese Red Army simultaneously attack a Shell facility in Singapore and the Japanese embassy in Kuwait. The Rome and Vienna Airport Attacks were two major terrorist attacks carried out on December 27, 1985. On that day, four terrorists walked to the ticket counter of Israel's El Al airlines at Leonardo Da Vinci International Airport in Rome, Italy, and opened fire with assault rifles and grenades. They killed 16 people and wounded 80 others before three of them were killed and the remaining one shot and captured by police. Five U.S. citizens were among those killed. Minutes later, at the Schwechat Airport (Vienna International Airport) in Vienna, Austria, three terrorists carried out a mirror attack. They killed four people and wounded 39 others. The terrorists then fled the airport by car, and Austrian authorities gave chase. They killed one terrorist and then captured another. In all, the attacks killed 20 and wounded 120. They were carried out by terrorists from the Abu Nidal group, which was retaliating for the Israeli bombing of PLO headquarters in Tunis on October 1. Libya was accused of funding the terrorists who carried out the attacks, but although they denied the charges they did praise the assaults.